Seasonal influenza is a viral infection that spreads from person to person through respiratory droplets. Seasonal influenza occurs throughout the world; outbreaks peak during the winter months of the northern and southern hemispheres and occur year round in the tropics. Influenza is usually self-limiting with recovery within two to seven days; severe illness and death can occur, particularly in those with pre-existing medical conditions. The three main ways to prevent seasonal influenza are good cough and hand hygiene, vaccination, and antiviral medication. Annual vaccination is recommended for some individuals prior to the start of the influenza season to provide protection to those who are at higher risk of severe illness. In addition to vaccination, special antiviral medications may be considered for some individuals in some circumstances either as treatment or prevention. Influenza is a viral infection of the respiratory tract; symptoms appear rapidly but last a relatively short period of time. In healthy individuals, influenza is usually self-limiting (i.e. it resolves without treatment), with recovery within two to seven days . There are three types of seasonal influenza viruses, types A, B, and C [1, 2]. Influenza A and B viruses cause outbreaks and epidemics. Only influenza type A viruses are known to have caused pandemics (i.e. worldwide spread of a new disease) [2, 3]. Influenza type C virus usually causes mild infections and is detected much less frequently . In April 2009, an influenza A/H1N1 virus of swine origin was the cause of a global pandemic which continued until July 2010 [4, 5]. This particular strain, influenza A(H1N1) pdm09, continues to circulate globally as seasonal influenza [5, 6]. The relevant strains influenza viruses to be included in seasonal influenza vaccines are determined each year by the World Health Organization (WHO) . Seasonal influenza occurs throughout the world. In temperate regions of the northern hemisphere most influenza activity is from November to March (between December and March in the United Kingdom). In the southern hemisphere most influenza activity occurs between April and September. In the tropics, influenza viruses can circulate throughout the year. Up to date worldwide information on seasonal influenza activity is available from the World Health Organization (WHO). Data on seasonal influenza activity in Europe is also available from the European Centre for Disease Prevention and Control. Influenza has been described as the most frequent vaccine preventable infection among travellers to tropical and subtropical countries [8-10]. The risk of exposure to influenza during travel depends on time of year, type of travel, destination and duration. However, travellers can be at risk during the summer months at their destination, particularly if travelling in large groups that include tourists from other regions of the world where influenza viruses are currently circulating . Transmission and spread of influenza infection is accelerated in crowded conditions (e.g. during travel by air plane, cruise ship or when attending mass gatherings) . There is limited data on foreign travel-related cases of influenza in the UK, as travel history is not routinely collected for seasonal influenza cases. Influenza virus spreads easily from person to person via respiratory droplets when coughing and sneezing. Crowded, enclosed environments facilitate transmission . 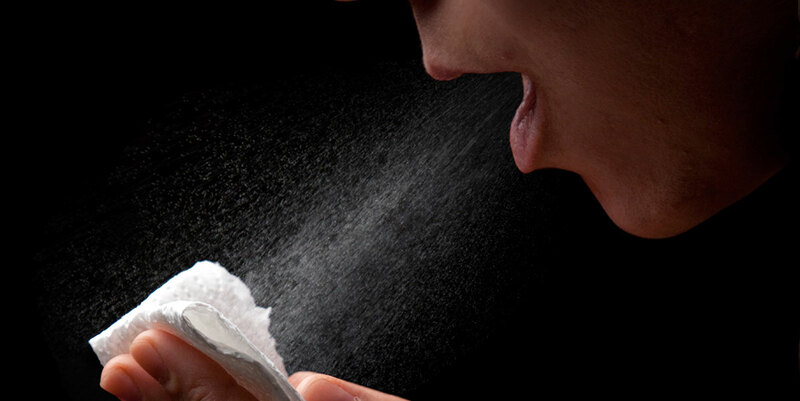 Another potential route of infection is from touching surfaces or objects contaminated with respiratory droplets and then touching the mucous membranes on the nose or mouth [1, 2]. Classic symptoms of influenza are the sudden onset of fever, chills, headache, cough (usually dry), extreme fatigue, sore throat, runny nose and muscle and joint pain [1, 2]. Influenza can affect all age groups, and the burden of disease on each age group can vary from season to season, depending on the strains circulating. Although infection is usually self-limiting, it can be complicated by secondary infections (such as bronchitis, bacterial pneumonia and ear infections). Influenza may exacerbate underlying medical conditions leading to life threatening illness. The elderly, the very young and those with serious medical issues (e.g. chronic (long-term) heart conditions, chronic respiratory conditions and immunosuppression), are particularly at risk. Unusually, influenza may be complicated by encephalitis (inflammation of the brain) and meningitis (infection of the protective membranes that surround the brain and spinal cord) . Pandemic influenza A (H1N1) pdm 09 in 2009/10 generally caused a mild disease in children and young adults, however, severe cases and deaths did occur in these age groups. In the UK, most deaths were in those younger than 65 years old, the majority of whom suffered from an underlying illness, although deaths in previously healthy individuals were documented. Pregnant women were also at higher risk of severe illness . During the influenza season, diagnosis is usually made by consideration of clinical signs and symptoms; specific testing for influenza virus (laboratory diagnosis) is usually only indicated in cases of complicated influenza , or for surveillance purposes. Vaccination against influenza is the most effective way of preventing the illness . See ‘Vaccine information’ section for details on who should be offered vaccination for personal protection. In the UK, influenza vaccines are prepared using virus strains recommended annually by WHO. The vaccine formulation is reviewed and changed as necessary to provide protection against strains of influenza viruses that are predicted to circulate in a given season. Information on epidemiological trends and circulating influenza viruses are gathered by WHO, to ensure the closest possible match between circulating influenza viruses and influenza vaccines . In the UK, influenza vaccines are prepared more than 6 months in advance of the northern hemisphere winter season. The vaccines are either trivalent (containing two influenza A subtypes and one influenza B subtype) or quadrivalent (containing two influenza A subtypes, and two influenza B subtypes). Most vaccines are grown in embryonated hen’s eggs. All but one influenza vaccine currently used in the UK are inactivated and do not contain live viruses. One vaccine, the intranasal administered vaccine (a nasal spray squirted up each nostril), contains attenuated (weakened), cold adapted viruses, which cannot replicate at body temperature. None of the vaccines available can cause clinical influenza in those that are vaccinated . Following vaccination, protection is thought to last for approximately one year, although this may be less for the elderly. After vaccination, antibody levels take 10 to 14 days to reach protective levels . Further information on the UK’s influenza programme, including information about vaccine virus strains, is available from Public Health England. Additional specific information for the current influenza season in the UK is available from Public Health England: annual national flu immunisation programme plan. The list above is not exhaustive. Public Health England states that influenza vaccine can be offered to others based on the clinical judgement of a health professional . In the UK, vaccination is not routinely recommended for travellers. Health professionals should carefully assess the risk of influenza for healthy travellers to tropical and sub-tropical regions during the influenza season at the destination. A decision to vaccinate healthy adults could be made but the vaccine cannot be given as an NHS service for this category of traveller. In the UK, northern hemisphere influenza vaccines for the winter season usually become available in October. Most of the stock is used over the winter and supplies may not be available during the spring and summer months. Currently, the southern hemisphere vaccine (which may contain different strains of influenza viruses as recommended by WHO) is not available in the UK. See Immunisation against infectious disease (The 'Green book' Influenza chapter) for further information on indications for influenza vaccine. The updated influenza chapter of Immunisation against infectious disease (‘Green Book’) should be consulted for current vaccine schedules, routes of administration and dosages. Detailed vaccine information can also be found in the manufacturer’s Summary of Product Characteristics (SPC) on the electronic Medicines Compendium (eMC). Very few individuals are unable to receive any influenza vaccine. As with all vaccines, anyone with a moderate to severe acute febrile illness should delay vaccination until they have recovered. The vaccine should not be given to anyone with a confirmed anaphylactic reaction to a previous dose of the vaccine, or to any component of the vaccine . Most influenza vaccines in the UK are prepared from viruses grown in embryonated hen’s eggs. Influenza vaccines with egg albumin content greater than 0.12 μg/ml, or where the content is not stated, should not be given to egg allergic individuals. Some influenza vaccines are either ‘egg free’ or have very low ovalbumin content. The ovalbumin content of available influenza vaccines and guidance on their use for individuals with egg allergy is available from Public Health England . A live attenuated influenza vaccine (LAIV) is administered by nasal spray and is contraindicated in children with severe asthma or active wheezing; an alternative inactivated influenza should be offered. The LAIV should not be given to immunosuppressed individuals, those with severe asthma, or active wheezing at the time of vaccination. Pregnant women should be offered an inactivated vaccine. Practitioners should refer to the ‘Green Book’ influenza chapter for further guidance and seek specialist advice if appropriate. Transient reactions such as soreness, swelling or redness at the site of injection can occur. Fever, malaise and other systemic symptoms are also reported . Following administration of LAIV, symptoms such as nasal congestion and a runny nose, headache and weakness occur commonly . Rarely, other more serious adverse events (i.e. convulsions, nerve pain and a temporary low platelet count in the blood) have been reported following influenza vaccination. However, no relationship between vaccination and these adverse events has been established . Please refer to the ‘Green Book’ Influenza chapter for detailed information. Allergic reactions such as angioedema (swelling of the lower layer of skin and tissue just under the skin or mucous membranes), bronchospasm (swelling and narrowing of breathing tubes leading to difficulties with breathing) and urticaria (hives), or full anaphylaxis (where these symptoms occur together very quickly and are life threatening) can rarely occur, and are usually due to hypersensitivity to egg protein .